The 2018 edition of the FIFA World Cup is here. Welcome to our daily updates of the world’s biggest football competition. 90+7′ The referee blows the final whistle. Ball possession is Nigeria 57% – Iceland 43%. 90′ Super Eagles Midfielder Oghenekaro Etebo leaves the field to be replaced by Alex Iwobi in a tactical substitution. Ball possession is Nigeria 59% – 41% Iceland. 82′ PENALTY – Nigeria’s Tyronne Ebuehi concedes a penalty for tripping Alfred Finnbogason. Gylfi Sigurdsson from Iceland hits the crossbar and misses the spot kick. 75′ GOAAAAAL: A brilliant effort from Ahmed Musa to double Nigeria’s lead. Kenneth Omeruo provided the assist for the goal. 66′ Nigeria create another good opportunity to extend their lead but Victor Moses sends the effort wide off target. 60′ Gylfi Sigurdsson from Iceland swings in the corner from the left to put Nigeria in a dangerous situation but Victor Moses relieves the pressure with a clearance. 57′ Danger as Onyinye Ndidi tries his luck from outside the box. The shot is deflected and forces Hannes Thor Halldorsson into an uncomfortable save. It’s corner kick. 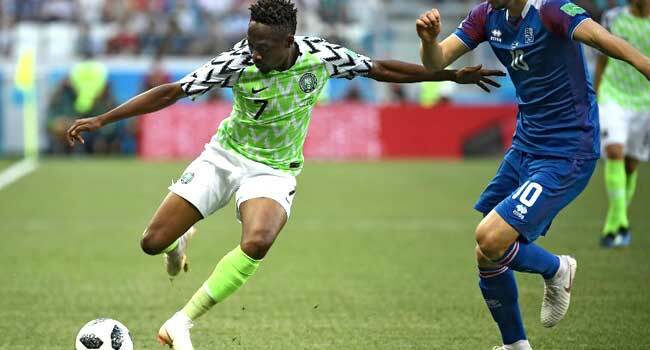 49′ G O O O A A A L – Ahmed Musa scores Nigeria’s first goal at the tournament. Victor Moses provided the assist for the goal. A clever photoshop skill got Lionel Messi among the Super Eagles supporters. 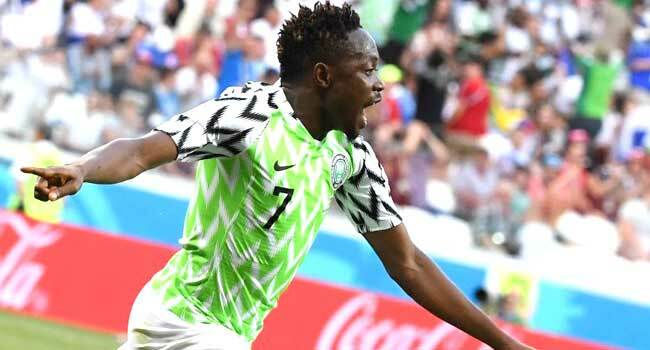 Nigeria’s forward Ahmed Musa celebrates after scoring their opener during the Russia 2018 World Cup Group D football match between Nigeria and Iceland at the Volgograd Arena in Volgograd on June 22, 2018. Mark RALSTON / AFP46′ The second half is underway. Here are what Nigerians are saying about Eagles’ performance after the first half. The @NGSuperEagles are playing very well but we really need that breakthrough goal.. I think we need one very sharp striker. 45+3′ The referee blows for half time. 45+1′ Birkir Saevarsson puts Nigeria in a dangerous situation with a cross. William Troost-Ekong clears the danger but is forced to give away a corner. A chance presents itself as Gylfi Sigurdsson swings in the corner from the left but Jon Dadi Boedvarsson’s header goes wide. 40′ Nigeria create a good opportunity to score as Onyinye Ndidi puts in a dangerous cross. Hannes Thor Halldorsson rushes out to claim the ball. Ball possession is Nigeria 59% – 41% Iceland. Na wa o did our fans forget to carry their trumpets ?? This super eagles don’t know when someone is serious. 31′ Ragnar Sigurdsson from Iceland cuts off the run of Kelechi Iheanacho, prompting the referee to award a free-kick. Oghenekaro Etebo crosses the ball into the box from the free-kick but it ends with a goal-kick. 20′ A chance for Nigeria as Victor Moses passes the ball in the box but it’s intercepted by an Iceland player. 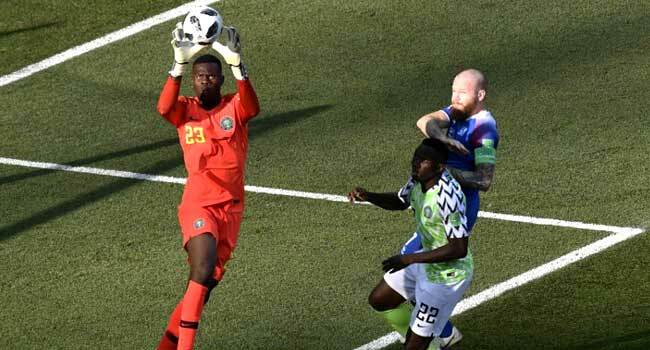 The Super Eagles are still in control of the game with 58% – 42% ball possession. 14′ Pressure for the Super Eagles as a player from Iceland takes a long throw from the left side of the pitch into the opponent’s box. Captain John Mikel relieves the pressure. 10′ Nigeria take control of the ball and try to create a good chance. 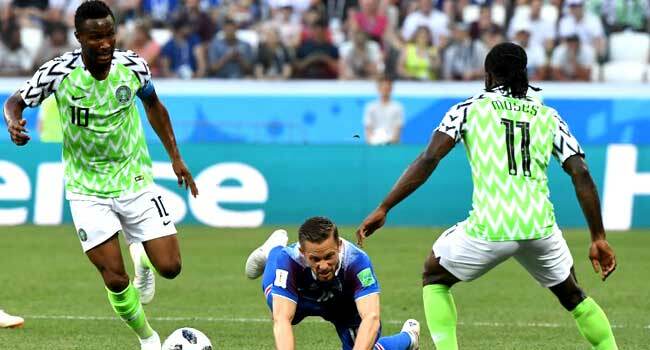 Ball possession in the first 10 minutes is Nigeria 59% – 41% Iceland. 2′ Nigerian defender Brian Idowu is penalised for pushing Kari Arnason. Gylfi Sigurdsson takes the free-kick and his strike forces a good save from Francis Uzoho. 4:00 pm: Match kicks off. 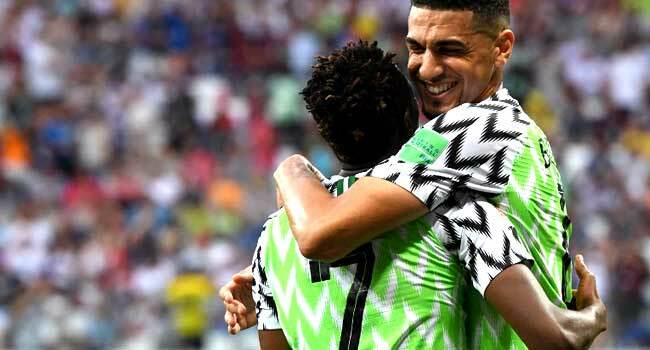 The match is very crucial for the Nigerian team because it will determine their fate at the competition as they are currently at the bottom of the table. Nigeria lost their opening match to Croatia 2-0 while Argentina and Iceland played 1-1 last week. 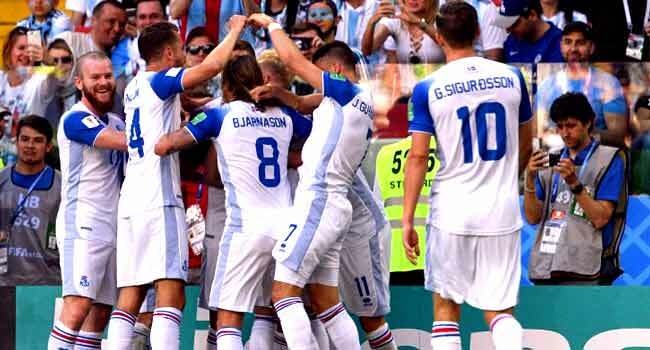 The Croats continued their winning streak on Thursday when they beat Lionel Messi led Argentina team 3-0 to dominate the group. Should the Super Eagles beat Iceland today, they will move to the second spot on the table with three points while Iceland and Argentina will remain at the bottom with one point apiece. Meanwhile, the Super Eagles Supporters’ Club fans are already in Volgograd ahead of the game. The football supporters are anticipating a victory for the three-time African champions to stand a chance to advance to the round of 16 in the tournament. 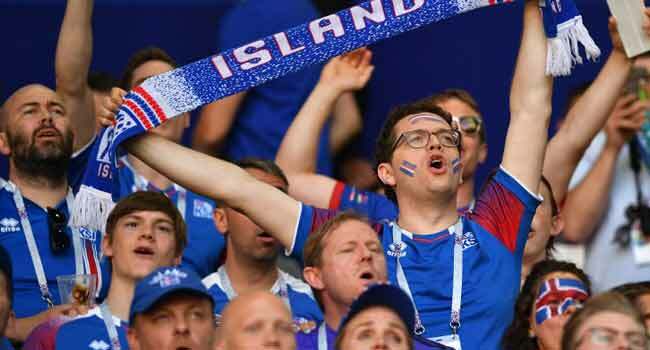 A fan dressed as a prophet rang a bell and chanted a prayer predicting, a win for Nigeria while bemused Iceland fans watched them. The Icelanders said they admired the show put up by the Nigerians but shrugged off the ‘prophet’s” prediction. 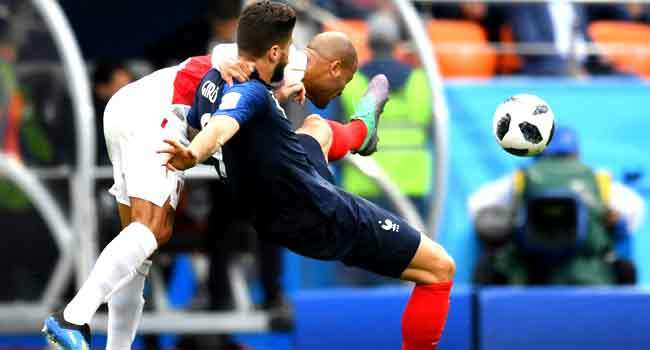 France reached the last 16 of the World Cup on Thursday after Kylian Mbappe’s 34th-minute goal defeated Peru. Mbappe made the difference and France are into the knock out stage while Peru are out of the World Cup. Full Time: France 1-0 Peru. 31′ Jose Guerrero from Peru found himself in a great scoring position but Hugo Lloris denied him with a brilliant save. 10′ Peru’s Alberto Rodriguez chips the ball into the penalty area but the ball gets into Hugo Lloris’ safe hands as he comes out to claim it. Ball possession in the first 10 minutes is France 48% – 52% Peru. 4:00 pm Referee blows the opening whistle. France: Hugo Lloris, Benjamin Pavard, Raphael Varane, Samuel Umtiti, Lucas Hernandez, Paul Pogba, Ngolo Kante, Blaise Matuidi, Antoine Griezmann, Olivier Giroud, Kylian Mbappe. Thank you. Join us by 4:00 pm for the next match between France and Peru. 90+4′ The referee blows the final whistle. Both teams played 1 all with ball possession: Denmark 49% – Australia 51%. 80′ Pione Sisto from Denmark has an opportunity and directs the ball behind the defence but the chance eventually goes begging. 72′ Tom Rogic from Australia shoots from outside the box but Kasper Schmeichel has it under control. A few seconds later, Pione Sisto gets a wonderful chance to score but somehow misses the target! 57′ Denmark’s Lasse Schoene tries to head the ball to his team-mate but it is intercepted by an Australian player. Simon Kjaer later commits a foul by elbowing Mile Jedinak from Australia. 45+3′ The referee blows the whistle for half time. The first part ended 1-1 with Denmark 46% – 54% ball possession. 45′ Simon Kjaer from Denmark crosses the ball, but his team mate arrives a little late and can’t benefit from it. Safe hands from Mathew Ryan as he comes out and claims the ball. 38′ G O O O A A A A A A L – Mile Jedinak puts it away from the penalty spot! The scoreline has been levelled. 37′ Yussuf Poulsen from Denmark is shown a yellow card by the referee. The referee the situation and awards a penalty in favour of Australia. 20′ Tom Rogic from Australia creates a good chance when he cuts the opponents’ defence open with a through ball but Henrik Dalsgaard clears the danger for Denmark with a good tackle. 7′ G O O O A A A A A A L – Denmark are now leading. Christian Eriksen scored the goal while Nicolai Joergensen provided the assist. 6′ Australia’s Matthew Leckie has a great chance to score but sends his header wide of the goalpost. It is goal-kick for Denmark. 1′ The referee starts the match. Denmark kick-off and the game is ongoing. 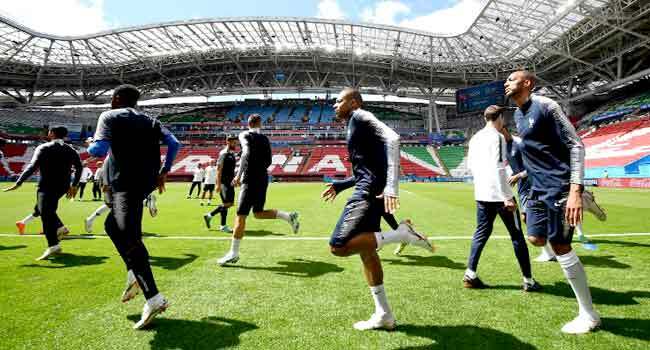 Australia coach Bert van Marwijk named an unchanged starting line-up for their crunch World Cup clash with Denmark on Thursday following their opening 2-1 defeat to France. The Socceroos, who have made it into the last 16 only once, in 2006, need to beat the Danes to have any chance of repeating the feat. 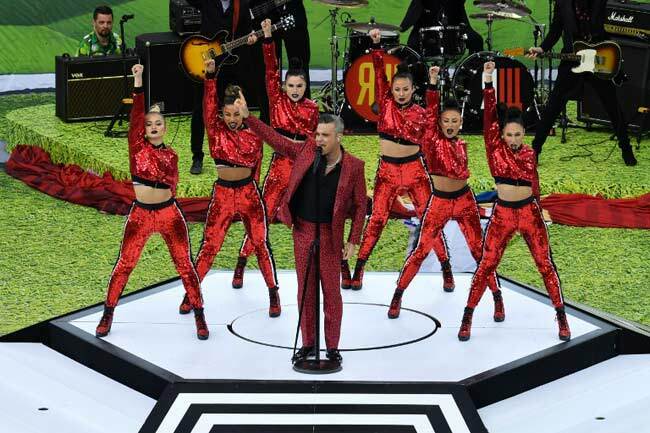 Despite having several attacking options at his disposal, including veteran Tim Cahill and 19-year-old starlet Daniel Arzani, Van Marwijk has stuck with the same side that asked questions of France in the defeat in Kazan sealed by a late Aziz Behich own goal from a Paul Pogba strike. Denmark opened their Group C campaign with a 1-0 win over Peru, in which Leicester City goalkeeper Kasper Schmeichel performed heroics before frontman Yussuf Poulsen hit the winner. Schmeichel, the son of former Manchester United legend Peter Schmeichel, is expected to be key to their hopes of a second straight win as the Aussies look to build on a solid defensive display against France by being more creative and, ultimately, scoring crucial goals. Australia, however, will also be wary of danger man Christian Eriksen, the Tottenham midfielder who scored 11 of their goals in qualifying. Today’s three matches are in three different time zones! That is it for the game. 90′ Herrera picks up a late yellow card for a clumsy foul. Muller picks up Germany’s first yellow card of the game for a blatant shirt pull on Herrera. 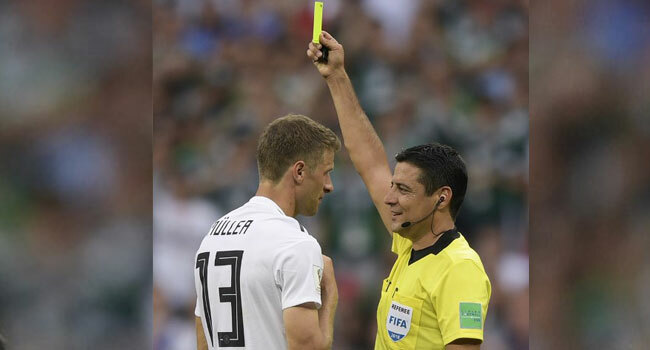 Germany’s forward Thomas Mueller (L) receives a yellow card from Iranian referee Alireza Faghani during the Russia 2018 World Cup Group F football match between Germany and Mexico at the Luzhniki Stadium in Moscow on June 17, 2018. 70′ PENALTY SHOUT! Hernandez is found by a searching through ball and he has the goal at his mercy. He comes under pressure from Hummels, falling to ground but he was certainly looking at it. 62‘ Into the final 30 minutes of the game both sides are still looking for at least one clear-cut opportunity to find the net. Mexico would love to double their lead but Germany are dictating the tempo of the game. 52′ Germany are enjoying the lion’s share of possession in the minutes since the restart but they’re yet to find a way through the Mexico defence. 46′ KICK-OFF! We are back underway. 42′ There have been 9 shots on target in this game – the most in the first half of a World Cup game since 2006. 40′ Moreno picks up the game’s first yellow card for wasting time. 35′ GOAL! Mexico 1-0! Lozano has been all over the Germany defence in the opening half hour and he’s finally got his reward. Hernandez leads the charge and feeds the PSV ace on the left, who cuts inside and fires into the bottom left-hand corner. 31′ It’s a very physical game, with fouls all over the field, but we’re still yet to see a huge chance for either side. The play in the final third so far has disappointed. 12′ Mexico remain dangerous and Germany are certainly not getting things all their own way. The atmosphere within the stadium is absolutely rocking. 9′ Free-kick to Mexico in a dangerous central position, which Layun is lurking over. However, his effort is way over Neuer’s bar. 3′ WIDE! Werner now showing his pace in the final third from Germany, latching onto Kimmich’s through ball but dragging a shot wide of the far post. 1′ KICK-OFF! Mexico get underway in the Luzhniki Stadium in Moscow. Mexico XI: Guillermo Ochoa; Carlos Salcedo, Hugo Ayala, Hector Moreno, Jesus Gallardo; Miguel Layun, Andres Guardado, Hector Herrera; Carlos Vela, Javier Hernandez, Hirving Lozano. Germany XI: Manuel Neuer; Joshua Kimmich, Jerome Boateng, Mats Hummels, Marvin Plattenhardt; Sami Khedira, Toni Kroos; Thomas Muller, Mesut Ozil, Julian Draxler; Timo Werner. Starting line-ups for the World Cup encounter between Germany and Mexico in Russia 2018 World Cup Group F match. That is is for today. Join us tomorrow for more updates. 95′: The referee blows the final whistle. Full time, Croatia 2-0 Nigeria. 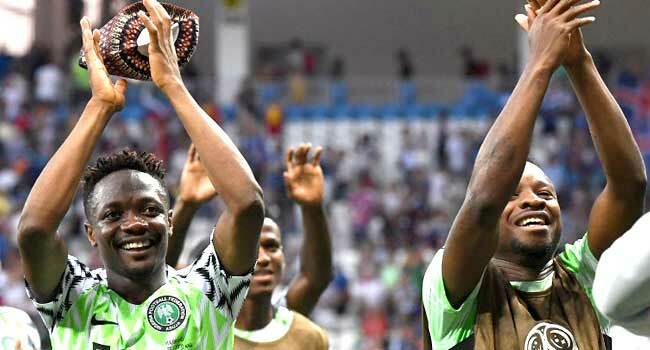 Nigeria’s players react after the Russia 2018 World Cup Group D football match between Croatia and Nigeria at the Kaliningrad Stadium in Kaliningrad on June 16, 2018. 75′: Ivan Perisic sends in a cross but Francis Uzoho comes out and claims the ball. 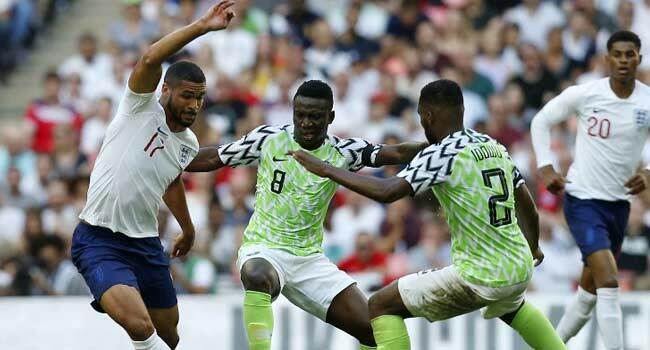 73′: Croatia start a counterattack: Great tackle by Troost-Ekong to avert danger for Super Eagles. 71′: GOOOAL! Luka Modric steps up and tucks it in. Croatia 2-0 Nigeria. 70′: PENALTY! The referee points to the spot after William Troost-Ekong pulls Mario Mandzukic by the shirt in the box. Not good for Nigeria. 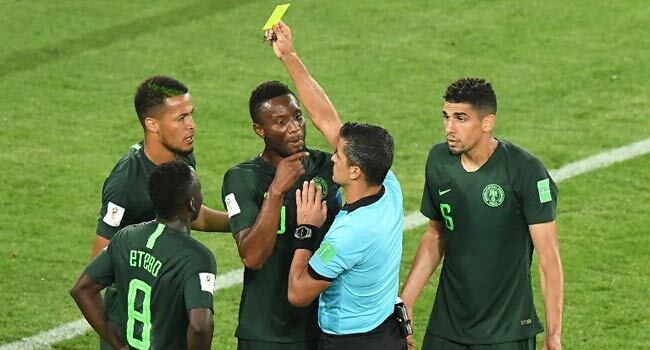 Nigeria’s defender William Troost-Ekong (L) receives a yellow card from referee Sandro Ricci during the Russia 2018 World Cup Group D football match between Croatia and Nigeria at the Kaliningrad Stadium in Kaliningrad on June 16, 2018. 62′: Substitution for Nigeria: Alex Iwobi is replaced by Ahmed Musa. 60′: Croatia make the first change of the game. Andrej Kramaric is replaced by Marcelo Brozovic in a tactical substitution. 50′: Victor Moses puts Nigeria under pressure after fluffing an attempt to clear Sime Vrsaljko’s cross. He is let off the hook as Ivan Rakitic fails shoots wide from outside the box. 49′: Victor Moses shoots wide after showing good skill to dribble past his opponents. 46′: We are back underway. 8:47 pm: The referee brings the first half to an end after two added minutes. Possession: Croatia: 58%, Nigeria: 42%. 8:43 pm: Mario Mandzukic finds Sime Vrsaljko inside the Eagles’ box but he lets a good chance go begging by shooting wide. 8:41 pm: Croatia’s Ante Rebic is injured and receives treatment off the pitch. 8:37 pm: Croatia intercepts the ball and start a counterattack. Sime Vrsaljko mishits a cross and the ball goes off target. 8:32 pm: OWN GOAL! Oghenekaro Etebo has put the ball into his own net. Croatia 1-0 Nigeria. 8: 22 pm: Pressure from Nigeria: An Odion Ighalo cross is blocked and Dejan Lovren gives away a corner under pressure. Victor Moses Swings in the corner but Sime Vrsaljko relieves pressure with a clearance. The falls to Iwobi whose teasing cross is cleared by Lovren. Captain Mikel then chips the ball into the penalty box but once again it is cleared. 8:20 pm: Croatia is bossing possession 66%, leaving Nigeria with 34%. 8:13 pm: Brian Idowu has a cross blocked. 8:08 pm: Alex Iwobi tries to create a chance. He sends the ball behind the defence but none of his teammates benefit from it. 8:00 pm: We are underway. After Argentina and Iceland played out a 1-1 draw, the Eagles can boost their chances of progressing from the tough group with victory here. Full time: Peru 0-1 Denmark. Denmark beat Peru 1-0 in both sides’ World Cup group stage opener on Saturday after Christian Cueva blasted over a VAR-awarded penalty for the Peruvians in Saransk. Yussuf Yurary Poulsen capitalised for the Danes, slotting into the net in the 59th minute. Thank you for your time. Join us again by 5:00 pm as Peru take on Denmark. 90+6′ It’s full time and the scoreline is Argentina 1 – 1 Iceland. 90+4′ Nicolas Otamendi puts in a cross but Hannes Thor Halldorsson rushes out to claim the ball. The referee signals a free kick as Emil Hallfredsson from Iceland trips Lionel Messi. 63′ The referee awards a penalty against Iceland after Hoerdur Magnusson makes a rough tackle against Maximiliano Meza. Johann Berg Gudmundsson is injured and is replaced by Rurik Gislason. It’s heart-breaking for Argentina as Lionel Messi takes the spot-kick but Hannes Thor Halldorsson stops the ball. 46′ The second half is underway. 45+2′ Iceland get a chance but Gylfi Sigurdsson fails to connect properly on the volley and sends the ball wide of target. The referee blows the whistle for half time. Incredible. Iceland have levelled the scoreline. Alfred Finnbogason volleys the ball into the back of the net. The ball possession is Argentina 72% – Iceland 28%. Sergio Aguero puts the ball in the net for Argentina. Marcos Rojo made the assist. 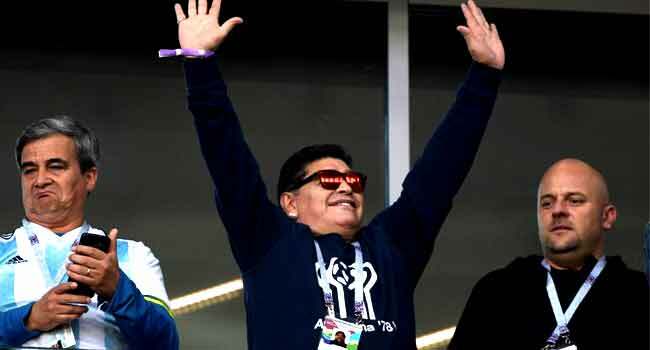 Meanwhile, Football legend Diego Maradona is at the stadium to watch the match. 13′ Argentina try to create a chance but Nicolas Otamendi fails to find the target with a shot from outside the box. 4′ A reckless challenge as Kari Arnason commits a rough foul on Nicolas Tagliafico. Argentina’s Lionel Messi crosses the ball into the box from the free kick and creates a chance for Marcos Rojo who heads the ball off the goalpost. 1′ The referee blows the whistle and the game starts. The World Cup opener between Argentina and Iceland has begun. Thank you for staying with us. Join us by 2:00 pm for updates on the Group D match between Argentina and Iceland. 90+6′ Referee blows the final whistle. The game ends with the scoreline France 2-1 Australia. 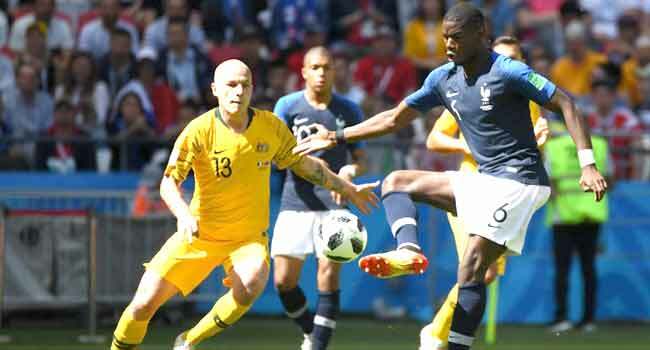 90+5′ An Australian player takes a long throw from the left side of the pitch into the opponent’s box but Paul Pogba clears the ball to relieve the pressure on France. Paul Pogba reclaims the lead for France after his effort is deflected past the goalkeeper. Olivier Giroud provided the assist for the goal. 75′ Nabil Fekir makes a good pass into the box but his French teammates fail to take advantage of the chance. The referee awards another penalty just four minutes later. This time, it is against France after Samuel Umtiti handles the ball in the box! Mile Jedinak takes the kick and equalises for Australia. The scoreline is now 1-1. The referee shows Joshua Risdon a yellow card after a foul in the box and awards a penalty in favour of France. Antoine Griezmann puts it away from the penalty spot! 47′ The restart is underway. 45+2′ France take a throw-in at the left side of the pitch in Australia’s half of the field and the referee blows for half time. 30′ France reclaim the ball possession by 52% while Australia have 48%. Paul Pogba creates a chance when he cuts the opponents’ defence open with a through ball. But it is not enough to make a goal. 25′ The ball possession is France 49% – Australia 51%. Benjamin Pavard from France passes the ball in the box but it’s intercepted by an Australian player. 18′ Corentin Tolisso makes a weak attempt to clear the ball which puts his side under pressure. Hugo Lloris, however, makes a great save for France. 2′ Antoine Griezmann takes the first corner for France from the right. 11:00 am: Match kicks off. It’s the third day of exciting games at the global football tournament. Four matches featuring two groups will be played today. The first match is between France and Australia by 11:00 am Nigerian time while Peru will take on Denmark by 5:00 pm at the Mordovia Arena in Saransk in Group C.
The opening game In Group D is between Argentina and Iceland at the Spartak Stadium in Moscow at 2:00 pm, after which the Super Eagles of Nigeria will take on Croatia at 8:00 pm at the Kaliningrad Stadium in Kaliningrad. 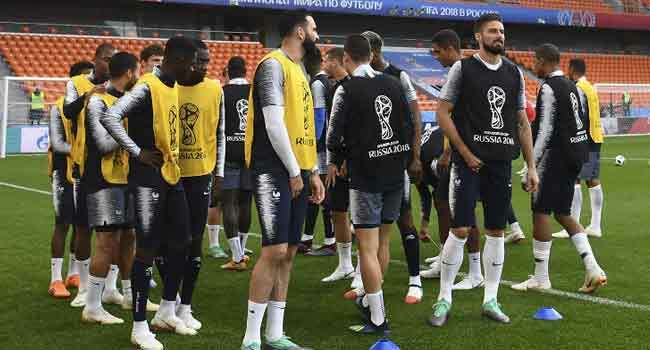 Meanwhile, France Coach Didier Deschamps has left Chelsea striker Olivier Giroud on the bench for their opener as teenager Kylian Mbappe leads Les Bleus’ front line in Kazan. 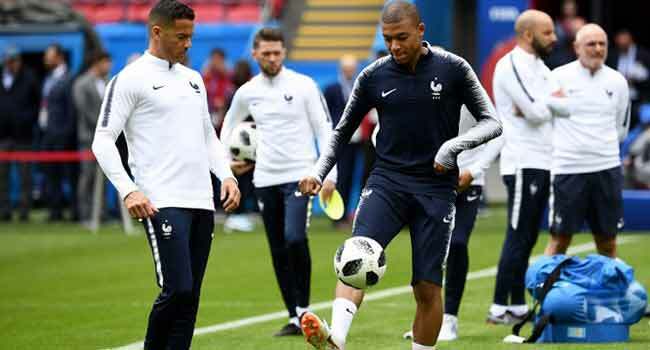 Mbappe, one of 14 players in France’s squad who have yet to feature in a major tournament, has been in great form for Paris Saint-Germain last season and will kick off the opener flanked by Atletico Madrid’s Antoine Griezmann and Ousmane Dembele of Barcelona. READ MORE. Thank you for following our updates for Friday. Join us again on Saturday for more stories and updates from the World Cup as the competition unfolds. 96′: That is it. The referee brings the game to an end. Both side had several chances and the six goals scored show that they took some of the chances but that wasn’t enough to claim all three points. 90′: There will be four minutes of added time. 88′: Gooooooaal! Hat Trick. Ronaldo creates a goal from a free kick. Some would have been forgiven for thinking Spain had all the points in the bag. But the five-time Ballon d’Or winner is not having that. 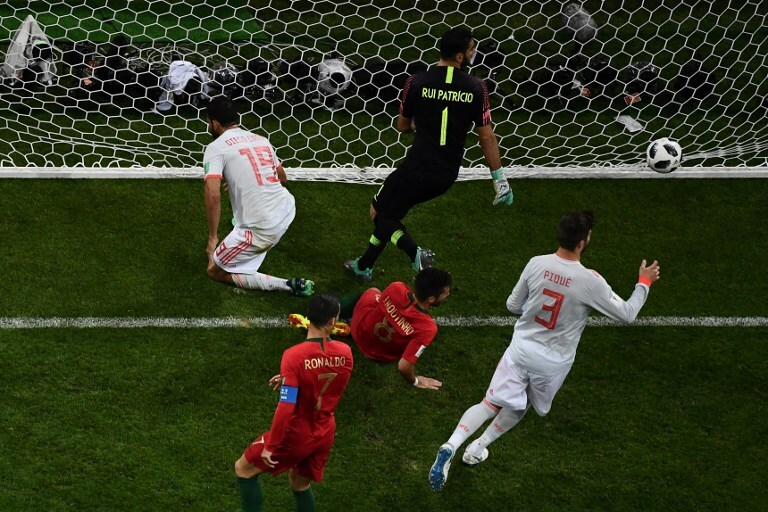 80′: Portugal have been unable to react to Spain’s lead and are gradually fading out of the game with Fernando Hierro’s men now bossing possession. Portugal, 38%; Spain, 62%. 58′: Gooooooooal! Spain has taken the lead with a great goal. Nacho Fernandez who has been shaky in defence compensates in attack with a great volleyed goal. Spain take the lead after going behind twice. 55′: Goooooaaaaal! Costa has hit the back of the net again. 2-2, game on. 8:02: The game is back underway. Meanwhile, here is what Ronaldo’s heroics so far mean. 7:44: Gooooal! Ronaldo again. The Real Madrid forward ensures his side goes into the break with the lead. Portugal’s forward Cristiano Ronaldo celebrates after scoring the second goal during the match. 7:28 pm: Portugal’s Bruno Fernandes picks the second yellow card of the game for tripping Nacho Fernandez. 7:26 pm: Almost! The crossbar denies Isco what would have been a great volleyed goal. Portugal would be thankful for that. 7:24 pm: Goooooal! Diego Costa levels the scores for Spain after a fantastic display of individual skills to dribble past some defenders. Spain’s forward Diego Costa (2R) celebrates his goal with teammates. 7:20 pm: Spain have reacted well after going behind and is in control of possession but Portugal is not far behind. Portugal, 48%; Spain, 52%. 7:17 pm: Spain’s Sergio Busquet becomes the first player to be booked for his rough foul on Goncalo Guedes. 7:04 pm: Gooooal! It’s Cristiano Ronaldo. Great start for Portugal. Nacho trips Ronaldo three minutes in. And Portugal’s greatest goal score makes no mistake from the spot. 1-0 to Portugal. 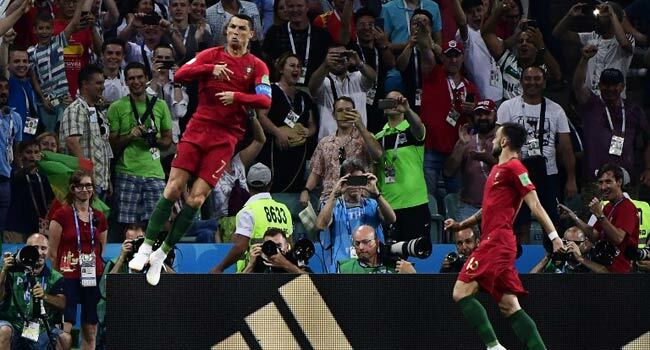 Portugal’s forward Cristiano Ronaldo (L) celebrates his first goal during the Russia 2018 World Cup Group B football match between Portugal and Spain at the Fisht Stadium in Sochi on June 15, 2018. 7:00 pm: Portugal and Spain kick off their much-anticipated game. 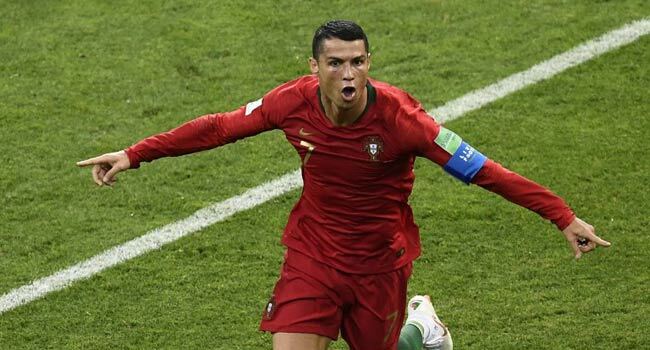 Cristiano Ronaldo will be hoping that his side will be able to benefit from the controversy that hit the Spain camp with the decision of the Spanish FA to fire coach Julen Lopetegui on the eve of the World Cup. Diego Costa starts in attack and Nacho at right-back in new Spain coach Fernando Hierro’s starting line-up for Friday’s World Cup Group B showdown with neighbours Portugal in Sochi. The team is that which would likely have started under Julen Lopetegui, had he not been sensationally sacked on Wednesday following the announcement that he would be joining Real Madrid after the tournament. 06:00 pm: The referee blows the final whistle. The scoreline is one – nil in favour of Iran. Aziz Bouhaddouz sends the ball into his team’s net. Iran have taken the lead. 05:39 pm: Iran captain Masoud Shojaei hands over his band to a fellow team-mate before leaving the field. He’s being replaced by Mehdi Taremi in a tactical substitution. 05:16 pm: The referee paused the game after sighting a player lying on the pitch. Omid Ebrahimi from Iran was injured and taken off the field to receive medical treatment. The match continued after a few minutes. 05:08 pm: Second half is underway. 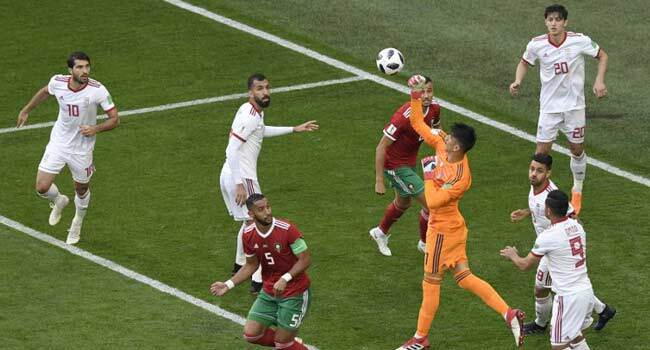 The referee whistles a free kick after Morocco’s Hakim Ziyech tripped Ehsan Haji Safi. 04:48 pm: The referee blows the half-time whistle. The scoreline is 0-0. 04:38 pm: Morocco lost a chance Hakim Ziyech crossed the ball, but his team-mate arrived a bit late. 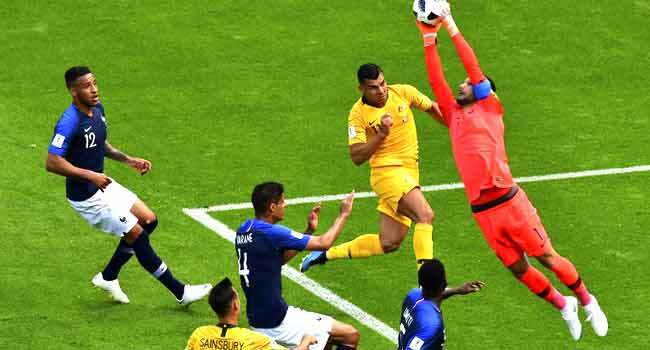 Iran’s Alireza Beiranvand rushed out and claimed the ball. 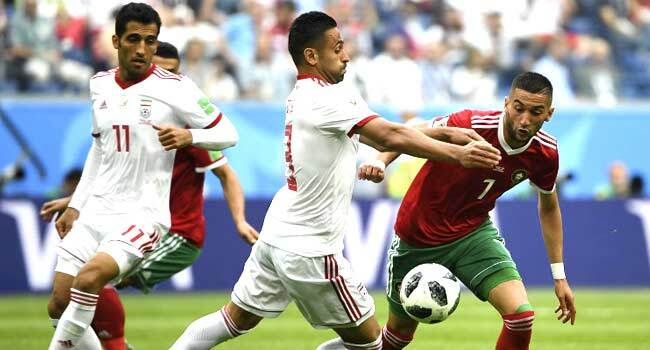 04:21 pm: The ball possession is Morocco 73% – Iran 27%. However, Iran begin a counter-attack; Karim Ansarifard passes the ball in the box but it was intercepted by a Moroccan player. The referee is Cuneyt Cakir from Turkey. 03:55 pm: The first Group B match between Morocco and Iran to kick off in a bit. 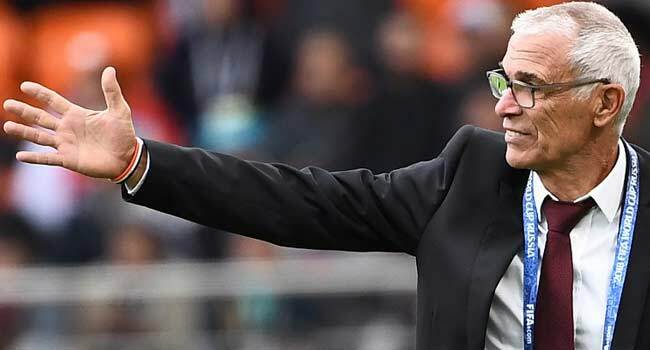 Reacting to the match, Egypt coach Hector Cuper said Mohamed Salah was kept on the bench because the team did not want to risk further injury to the Liverpool star. Salah, who turned 26 on Friday, injured his shoulder three weeks ago in Liverpool’s Champions League final defeat to Real Madrid. READ MORE. 2: 57 pm: The referee blows the final whistle and the match is over. It was a tough match between both teams but Uruguay managed to carve out the victory. Uruguay’s Carlos Sanchez provided the assist while Jose Gimenez scores with a header. 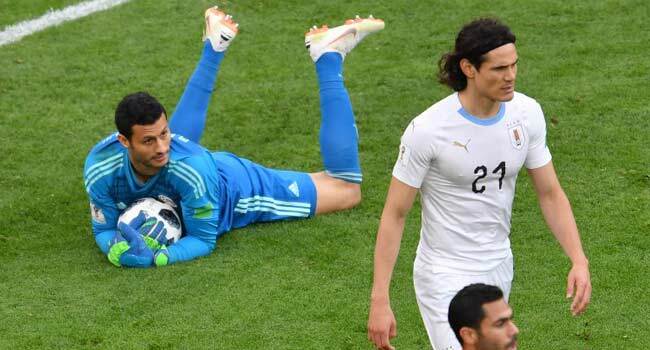 2:40 pm: Uruguay’s Edinson Cavani connects well on the volley but Mohamed El Shenawi makes a great save and the ball goes behind for a corner kick. 2:33 pm: Luis Suarez gets a chance as he finds himself in a one-on-one situation with the Egyptian keeper but Mohamed El Shenawi rushes out to claim the ball. 2:11 pm: Trezeguet from Egypt passes the ball in the box but it was intercepted by an opponent player. It’s a throw-in in favour of the African team. 2:05 pm: Second half is underway. 1: 47 pm: Referee blows the half-time whistle. 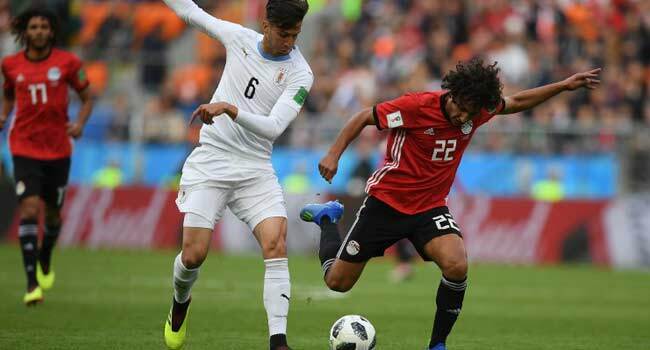 The first half ended with Egypt 43% – Uruguay 57% possession. 1:25 pm: The ball possession is Egypt 46% – Uruguay 54%. A cross from Nahitan Nandez of Uruguay is blocked by an opponent as he tries to pick out a team-mate in the position. 1:03 pm: Uruguay’s Luis Suarez sees his pass blocked by an Egyptian while the African team a throw-in at the left side of the pitch in their own half of the field. 1:00 pm : The match between Egypt and Uruguay kicked off. Netherlands’ Bjorn Kuipers is the referee. 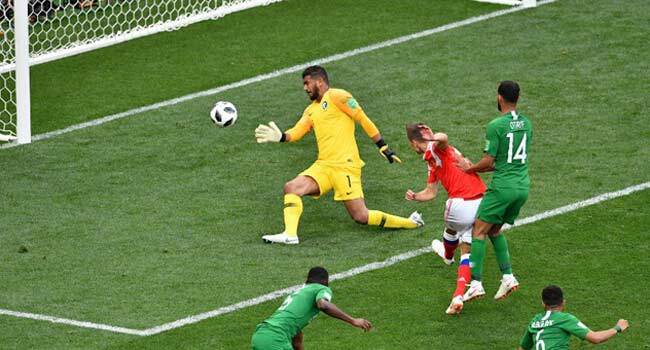 The intriguing performances continue in the second day of the 2018 World Cup with three matches featuring two African countries among others after the host nation, Russia routed Saudi Arabia 5-0 in the opening game. Egypt will take on Uruguay in the second Group A match by 1:00 pm Nigerian time at the Ekaterinburg Arena. 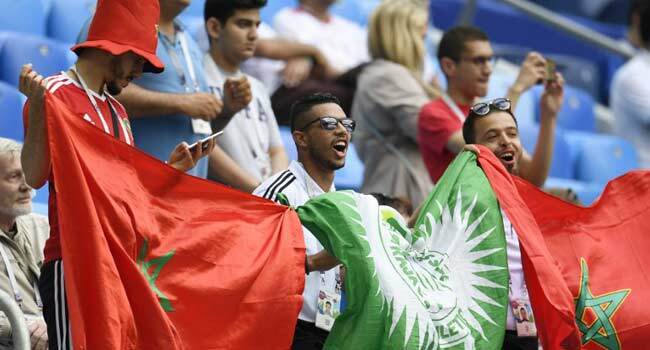 In Group B, Morocco will play Iran at the Saint Petersburg Stadium at 4:00 pm local time, while Portugal will contend with their European counterparts Spain three hours later at the Fisht Stadium in Sochi. 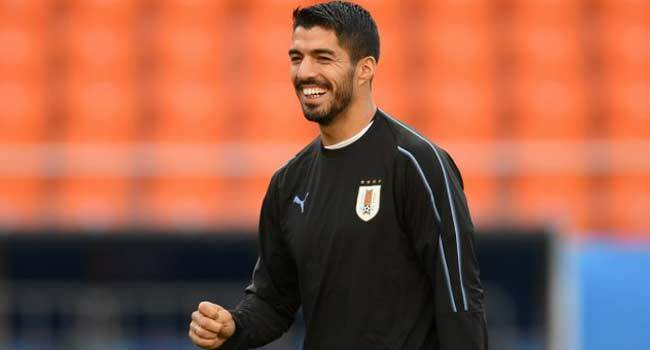 Meanwhile, Luis Suarez will be chasing redemption when Uruguay face Egypt in his first World Cup appearance since being thrown out of the tournament in 2014 for biting Italian defender Giorgio Chiellini. The controversial Barcelona striker, 31, was described on the eve of their first game in Russia as “more mature” by Uruguay coach Oscar Tabarez. READ MORE. 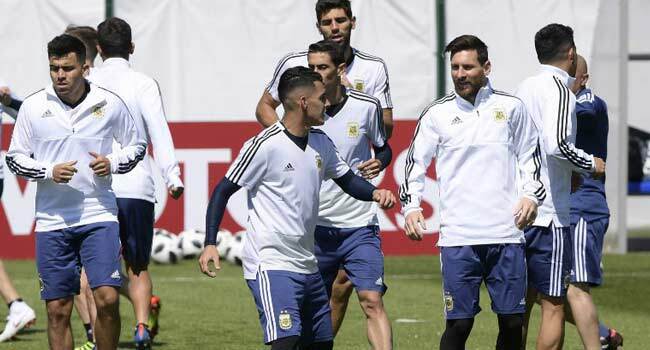 But Messi is a man on a mission as he chases his first World Cup winner’s medal and will not tolerate complacency against the minnows at Moscow’s Spartak stadium. READ MORE. 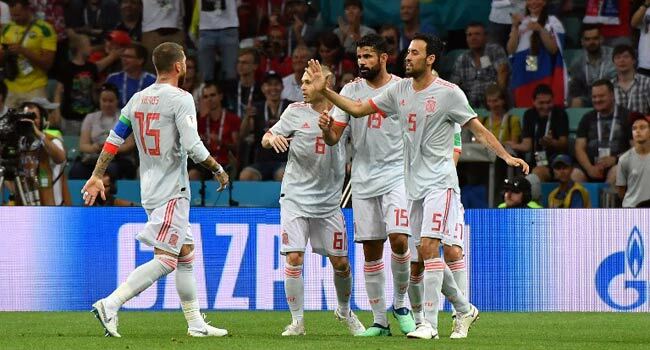 Elsewhere, Spain were one of the favourites when they arrived in Russia after a two-year unbeaten run under Lopetegui. The squad is, however, reeling after Wednesday’s snap decision by the Spanish football federation to dump Lopetegui after it was announced he would be joining Real Madrid following the tournament. Former Real stalwart Fernando Hierro has been thrown into the deep end as head coach, with little coaching experience and huge pressure on his shoulders. READ MORE. Thank you for your time and join us tomorrow for Friday’s updates. Please scroll down for more on the World Cup events. 5:57 pm: Full-Time Russia 5-0 Saudi Arabia. 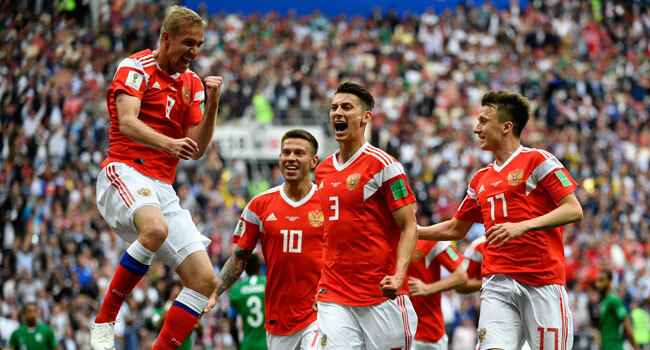 Russia’s midfielder Yuri Gazinskiy (L) celebrates scoring the opening goal with his teammates during the Russia 2018 World Cup Group A football match between Russia and Saudi Arabia at the Luzhniki Stadium in Moscow on June 14, 2018. 5:55 pm: Russia sealed their victory with two goals in less than seven minutes to the full time. Denis Cheryshev scored his second goal in 91 minutes while Aleksandr Golovin gave the host nation a wonderful finish when he curled a direct free kick into the back of the net. 5:31 pm: Again, Russia have scored their third goal. 5:06 pm: Second half is underway. After a few minutes to the restart, Russia’s Aleksandr Samedov could not find the target with a shot from outside the box. 4:48 pm: Referee blows for half-time. Denis Cheryshev extended the lead for the host country after dribbling past two Saudi Arabians thanks to Roman Zobnin’s assist. Yuri Gazinskiy has given Russia the lead and becomes the first player to score a goal in the 2018 World. Aleksandr Golovin provided the assist for the goal. 4:00 pm: Hosts Russia and Saudi Arabia have kicked off the 2018 World Cup proper. 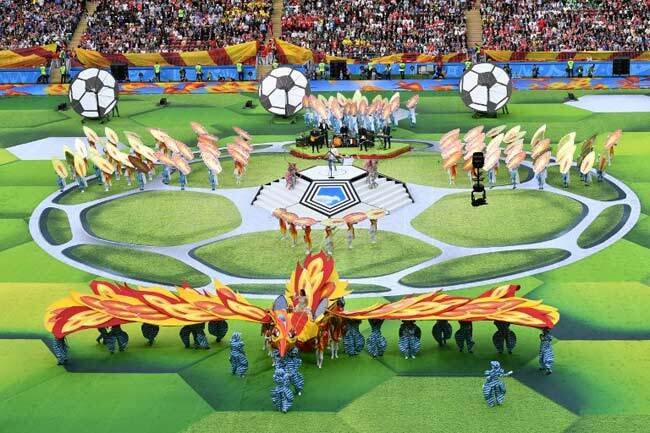 Actors perform during the opening ceremony before the Russia 2018 World Cup Group A football match between Russia and Saudi Arabia at the Luzhniki Stadium in Moscow on June 14, 2018. 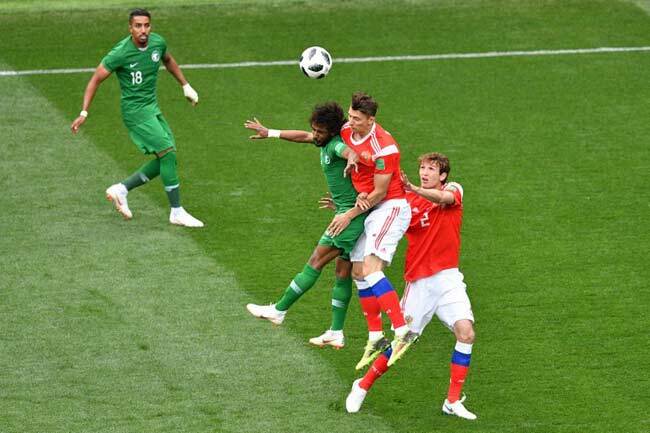 The host country, Russia will kick-start the competition by taking on Saudi Arabia by 4:00 pm Nigerian time. The 2018 FIFA #WorldCup is finally here! We are rivals, but we live football together! 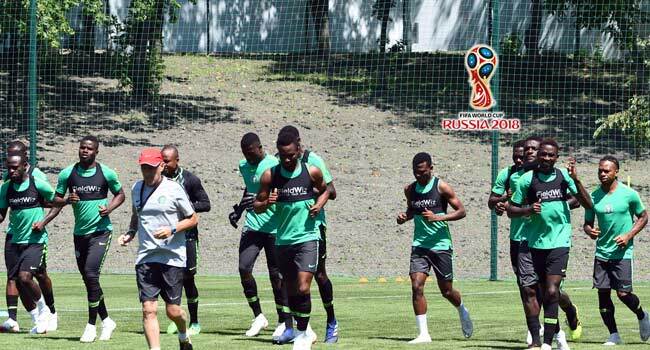 On the three occasions, the Super Eagles won their opening matches in the World Cup in 1994, 1998, 2014, and progressed to the Round of 16. 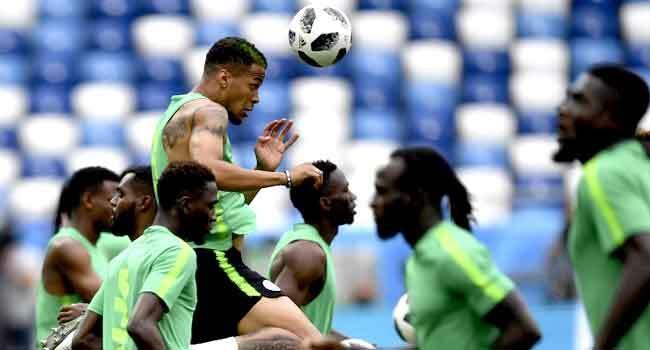 During their preparation ahead of the competition, Nigeria played a series of friendly matches during which they won two, drew one, and lost three. 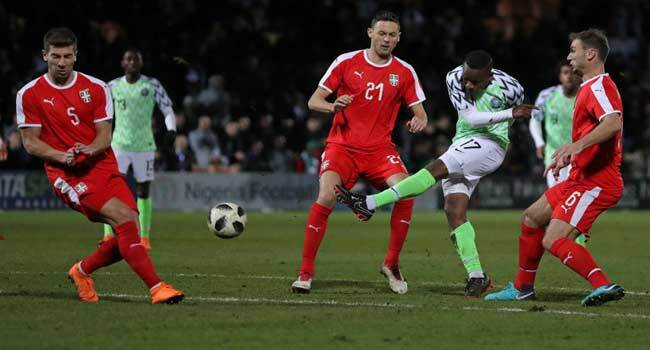 Nigeria’s midfielder Ogenyi Onazi (2R) shoots but fails to score past Serbia’s defender Matija Nastasic (L) during the International friendly football match between Nigeria and Serbia at the Hive stadium in Barnet, north London on March 27, 2018. The outcomes of some of the friendly, especially against England and Czech Republic, have become worrisome for Nigerians and other concerned individuals. 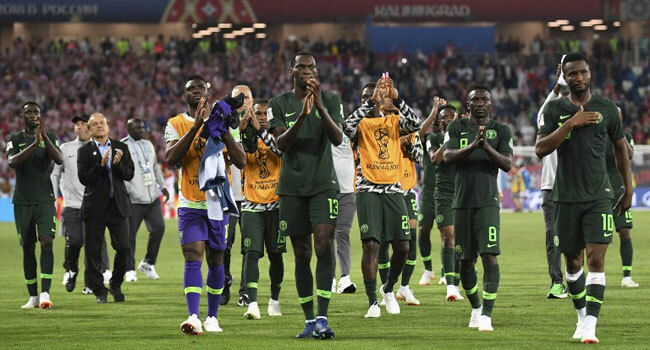 However, Super Eagles Media Officer, Toyin Ibitoye, urged Nigerians to pray for the team’s success and continue to support them.